Alexander Watson Associates (AWA) is a company with industry focus on the specialty paper, film, packaging, coating and converting sector. Their latest report on direct digital print technologies for containers is available to all DCP 2017 delegates at a special price of 400 EUR (the standard published price is 1,500 EUR). 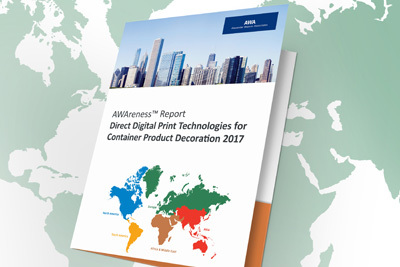 This is the second edition of the AWAreness™ Report Direct Digital Print Technologies for Container Product Decoration 2017. It focuses on the evolving methods for directly decorating rigid and semi-rigid containers using digital print technologies combined with UV and UV-LED curing processes. Direct printed forms of product decoration or of providing detailed user information are not new, and are already found in areas such as beverage cans, flexible packaging, cartons etc. These existing forms of direct print are not included in the report scope. This report focuses on the emerging forms of direct print, most especially those involving digital inkjet technologies. The areas of digital direct printing covered in the report are growth sectors, with emerging technologies. They have seen extensive technical development and innovation, and are now in the early stages of commercial development. The introduction of those technologies provides a new level of competition to more established forms of product decoration. The technology allows for a high degree of individual customisation, reduced inventories, shortened supply and value chains, and for shorter lead-times to end users/brand owners. The report describes the present state of the technologies available and the market dynamics. It also includes information about the future growth prospects and forecast penetration levels for these emerging decorating technologies. To purchase the report at the discounted rate please proceed to DCP delegate registration page.